The last time I reported about Kate Birch, I ended my post stating that I became so angry that I was about to write something that I might later regret. Let’s see whether I can restrain myself again. Modern parents and even medical practitioners often pose the question of whether the benefits of reducing the incidence of acute diseases through vaccinations is worth the risks of the increased incidence of immune system imbalanceas a result of those same vaccines. This often leads many into questioning if vaccinations for children are indeed safe. Despite the fact that most medical practitioners refute the possibility that vaccines can cause harm to the immune system, and that their purpose and efficacy have been instilled in people’s minds for the last 200 years, many parents still are looking for possible alternative ways of preventing and treating infants from the so many forms of infectious, contagious acute diseases. Certified classical homeopaths and authors Kate Birch and Cilla Whatcott want the world to know that there is an alternative path to the use of vaccination which is a more effective and less expensive method of helping to build immunity towards infectious disease. The Solution ~ Homeoprophylaxis: The Vaccine Alternative offers parents a wealth of useful information on the effective prevention of infectious diseases through homeoprophylaxis. The book introduces the basic principles of HP, and an overview of the immune system and how it iacs intended to work with infectious disease, what vaccines actually do in the immune system and a clinical overview of the homeopathic treatment of childhood eruptive diseases, febrile illnesses, and tropical diseases. This book is written in simple language to help parents navigate the question of immune system development, infectious disease prevention with homeoprophylaxis and if vaccines are really doing what they are intended to do. The authors clearly explain and differentiate important terminology such as immunology, vaccination, and immunization. What is amazing with this book is that Birch and Whatcott offer the world a different view on disease prevention and the use of HP as an immune system educator, and cite multiple references to clinical research and real time applications of the use of HP for disease prevention. 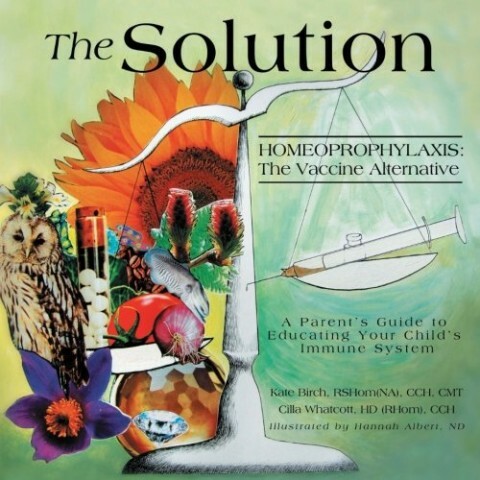 The Solution is a must-read for every parent, health care provider, and any concerned citizen who has questions about the current day vaccine paradigm. As adverse reactions and associated health problems are becoming more and more prevalent in children after receiving vaccinations The Solution offers another way. the epidemiological ‘evidence’ homeopaths cite for HP is misleading. The concept of HP lives off the herd immunity we have via conventional vaccinations and, at the same time, endangers this very immunity. It is a danger for both the public and the individual who might believe in it. In my view, promoting HP is unethical, irresponsible and possibly even criminal. – although it is clear that members of the SoH do not care for this position. Birch is member of the North American Society of Homeopaths (NASH) which doesn’t seem to have such a position this https://homeopathy.org/health-freedom/the-north-american-society-position-on-health-care-and-policy/ is the closest. OK, agreed on bashing Birch. You needlessly create through your phrasing a position uphill that is far too vulnerable to legitimate and valid and effective attacks there. If “highly diluted nosodes do nothing whatsoever” then “they are much safer than conventional vaccinations”. You do not have to have read philosophy that much to see that? ‘Real Vaccinations’® can be dangerous, and they can be ineffective. And cost/benefit has to be taken into account. Do you give a patient with a fresh kidney-transplant on immuno-suppressants every shot in existence at once? Do you ‘vaccinate’ everyone on Greenland against Malaria and other tropical diseases? Most of the people are conned way too many times by big pharma. Big Pharma even has its own homeopathological division! And they would like to call (for) the shots for everyone on Greenland. They want profit, and nothing more. No science, no healing – just profits. Big pharma in its current form cannot be our friend or ally here. And I would really appreciate if you could somehow format your quotes more visibly and(t traditionally. NO, IF NOSODES ARE USED AS ALTERNATIVES TO VACCINATIONS, THEY LEAVE PEOPLE UNPROTECTED WHICH POTENTIALLY IS LETHAL. Yes!!! They are also used by the deliberately deceitful (and the innocently duped) to show schools, daycares etc that kids are up-to-date on vaccines. That I was not aware of. Where in The World is this happening, Brenda? We need to get the word out about this. I was told by parents in two communities in western Canada that they had done this. Neither school/daycare has a mandatory vaccination policy, just an interest in keeping records, so there was no action the authorities could have taken even if they had been interested, (which they did not seem to be). I alerted the public health units to be on the lookout for “homeoprophylaxis”. I wrote to the federal Minister of Health (previous government), and received the ridiculous reply that since homeopathic “nosodes” are not legal in Canada, I needn’t be concerned. No need to shout. We know that. Not using real vaccinations leads to being not vaccinated, translating into too weak immune-response or too weak immunity to fight off an infection. That might prove preventably stupid down the road. But you didn’t say that originally. And it is still problematic in how you phrase your problem. HP are much safer _to_ _use_ than vaccinations. HP do nothing! That’s pretty safe. Vaccines do something – that’s maybe not so safe. The danger here is _in_ _the_ _use_ _itself_. As vaccination-critics say, read and understand it, this one is. Let me rephrase that: “understand it”. Since your explanation clarifies this short time triumph of logic. And only as one first aspect of the whole problem. Choosing HP to avoid vaccination and then believing in equivalent results and effectiveness is stupid. Although, being stupid: that’s just everyone’s right, like voting conservative. It endangers everyone and everything and needs stop. Soon. “Big Pharma” is far more regulated and accountable than “Big Woo”, which rampages in an unregulated sea of false claims. Wow! I thought that — just to educate myself about what Kate Birch knows about the immune system (anybody who talks of things like “increased incidence of immune system imbalance” has to be an entertaining read) — I looked up the book on the web. It seems to be out of date now, having been replaced with a volume called Vaccine Free: at an eye-watering price of $42 (Amazon) with no Kindle version available. Homeoprophylaxis, the vaccine alternative is still available for a mere $33 (and still no Kindle version). Camists sure know how to coin it! By the way Kate- wrong use of ‘refute’. By the way- if politeness forbids you from giving ill expression of your thoughts about this woman, I’ m up for the job. LONDON — The highest court of the European Union ruled Wednesday that courts can consider whether a vaccination led to someone developing an illness even when there is no scientific proof. The decision was issued on Wednesday in relation to the case of a Frenchman known as Mr. J.W., who was immunized against hepatitis B in late 1998-99. About a year later, Mr. J.W. was diagnosed with multiple sclerosis. In 2006, he and his family sued vaccine-maker Sanofi Pasteur in an attempt to be compensated for the damage they claim he suffered due to the vaccine. Mr. J.W. died in 2011. France’s Court of Appeal ruled there was no causal link between the hepatitis B vaccine and multiple sclerosis, and dismissed the case. Numerous studies have found no relationship between the hepatitis B shot and multiple sclerosis. After the case went to France’s Court of Cassation, it was brought to the European Union. On Wednesday, the EU’s top court said that despite the lack of scientific consensus on the issue, a vaccine could be considered defective if there was “specific and consistent evidence,” including the time between a vaccine’s administration and the onset of a disease, an individual’s previous state of health, the lack of any family history of the disease and a significant number of reported cases of the disease occurring following vaccination. this is good news for you, Iqbal ? Let me explain something to you. According to this decision your neighbour could sue you for anything – which incures costs for you, even if there is not the slightest proof except a coincidence. Normally to open a sealed tin, it is important to make open a small opening and then the material inside starts leaking. This leak increases with time and then everyone can see the contents. The picture has just begun. No need to panic now. Why don’t you read the news items you comment on, Iqbal? This one does not say what you seem to think it does. All we need now is Logos-Bios,, ‘Not-A-Doc Dale, and Colin, plus some silly woman who goes off in a grump because she mistook this for a ste where various ‘alternative therapies’ could be discussed, and wew’re back to the good old days! Oh, and someone who threatens to call the police in if anybody uses the phrase’ wingwang’. She states the many parents are looking for alternative ways other than vaccines to protect their children from infections, etc… WHY? Because quacks like her are brainwashing the world with such huge lies and false information. What is a “classical certified homeopath, anyway? Why would any intelligent society certify fake doctors of medicine, especially when they sell such nonsense that has no validity? This is ludicrous. It is comparable to certifying bus drivers to fly passenger jets or untrained bar bouncers to defend our country without military training. These con artists have no real medical training yet they are allowed to advertise and treat patients as if they did. It is unconscionable !! Vaccines have saved millions of lives! !